The Greeks of the high classical age put strong faith in the idea of fate and of an unavoidable course of life. They thought every life had a reason for beginning, and that reason was also its end. (Fate is distinguished from Destiny, which has more of an undertone of control.) 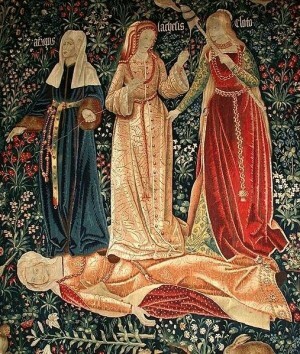 This divinely indifferent culmination of the course of life is what the three Fates represent. Their name in ancient Greek is Moira, which means “a portion,” so the three Moirae represent the personification of the share of existence that is meted out to all living things. The Moirae are ever-present in the Trojan story. The Moirae are not vindictive or evil, nor are they benevolent. They are indifferent. Appearing at the family hearth three days after the birth of a child, the Moirae, specifically Clotho, begin spinning the thread of the person’s life to the length allotted by Lachesis. When the time comes, Atropos will snip the thread. 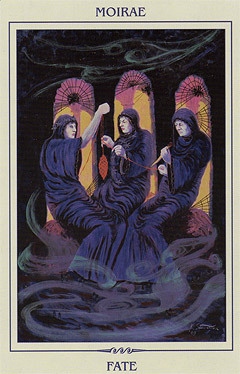 While they are sometimes portrayed as young women, generally the Fates appear as three ancient hags, indicative of the fearful realm they personify. Occasionally, they are shown as milky-eyed and blind. Wrinkled old crones and blind, unfeeling spinsters have counterparts in other ancient traditions as well. The Norns of the Norse and the Baltic Laima are spinning sisters who control or embody fate. Posted on April 6, 2011 by Mary	in Mary's Musings, Updates and tagged character, moirae, mythology.